You may or may not remember back in the Fall I participated in a six week challenge to Commit to Fit with SUBWAY Canada. I’m happy to report that my I’ve just begun another one of their six week challenges this Spring! Several other Canadian bloggers are joining me with the guidance of Carl Savard (@SUBWAYCarl), the SUBWAY Canada Commit to Fit Ambassador. Every week Carl emails us a health & fitness challenge and we report how we are doing via our blogs and social media accounts. 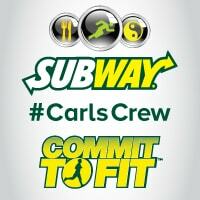 Look for the hashtags #CommitToFit and #CarlsCrew. This past week was Week One of the challenge. It was fairly easy for me since it’s been something I’ve been working on for awhile – drink more water! The focus for this week is based on one of the most important fuels our bodies need to keep us going every day: water. This week’s challenge is to drink 1L more water daily than you usually do, to a maximum of 2.7 L for women and 3.7 L for men. He went on to talk about the importance of staying hydrated. We need water to live. Water helps oxygen travel to our bloodstream, balance our body temperature and makes sure our cells are doing their jobs. Water also acts as a lubricant and cushion for joints. Carl pointed out that the goal was not drink as much water as you possibly can, but to instead, slowly increase your daily consumption to recommended maximums. I made sure to always bring my water with me wherever I go. I sometimes forget when I’m in a rush to grab the water bottle, but this week, I made sure to NOT forget to bring it! Stay tuned for the challenge for week two! We find out what it is tomorrow. I am replacing other drinks with water daily. Making sure I have it beside me on my desk. If it’s within reach, I’ll drink it. I recently put a double sized clear mug near where I work. Try to ensure it’s always got water in it. This is something I’m ALWAYS trying to do. I bring my water bottle to work and try to drink it to empty once before lunch, once at lunch, and once before the end of the day. I mark off the ounces in a cup with a marker, and then set goals to finish certain amounts by certain hours of the day. I always fill up my water bottle before leaving the house, and I make sure to drink water with every meal. I have water with me at all times. Pregnant and still breastfeeding a little, I need to have it with me everywhere! I quit eating white bread and sugar. I’m drinking less coffee, so I’m thirsty and replaceing coffee with water. I bought a new water bottle that you can infuse with fruit. I am putting timers on my phone to help remind me to drink water. Drink a big glass before each meal. I’ve been carrying my water bottle with me everywhere. I always have a bottle of water in my hand! I have a fancy new water bottle which for some weird reason it does make me want to drink more water. But I honestly still do not consume enough. A new water bottle helps me. I always have water at work, always. To make sure I drink more water I have it in a sealed nice looking container all ways around me! I have cut my soda intake to maybe 1 a week. I always have a glass of water next to me. I make a habit of drinking a glass before and after each meal. Water is available at work so I try to drink three cups while at work. If it’s cold I’ll probably drink it. I actively keep track of my water intake. Always carry my water bottle with me. After what I ate tonight, I’m going to have to behave for the next several weeks! I’ll certainly up my water intake starting tomorrow. Often when I think I’m hungry, I’m really just thirsty and don’t realize it.